I'm driving through one of my favourite corners on the Mumbai-Pune expressway, a long and fast right-hander. Almost every front-wheel drive car I've driven around this specific corner shows some sign of understeer, or the tyres tend to lose traction before straightening out. But the car I'm driving is now past the corner's half way point and still seems to be holding line - it's in control, the tyres aren't squealing and it almost feels all-wheel drive like. The car? It's an Audi, the A3 40 TFSI. We are convinced that this car is one of the most affordable and fun to drive Audis today, and no, it doesn't feature Quattro technology. Unlike the A3 TDI, the TFSI is only available in one trim level. The Premium Plus trim is one spec below the top end variant but gets a standard S-Line exterior package that includes a different front and rear bumper as well side skirts. 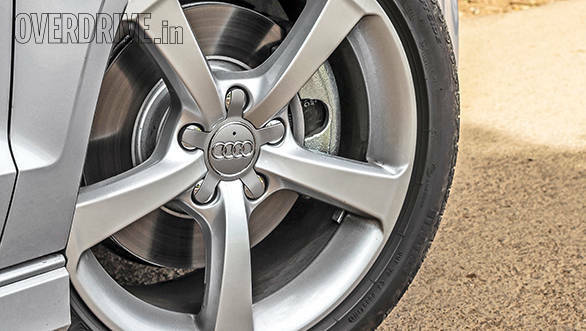 To compliment the package, 17-inch five-spoke alloy wheels are also offered as standard. All these additions make the A3 look a lot more sporty, any performance enthusiast will agree with us. The boot is a bit stubby, but overall the A3, especially in S-Line form, is a very smart looking car. The interior too is striking and unlike other Audis that look too similar to each other, the A3 features a distinct cabin and detailing. The centre console, for instance, is less cluttered and very neatly laid out, most controls are around the gear lever. The button and switches are all-new, and still, built well. The Premium Plus variant also gets 3-D inlays that are unique for any car and add to the overall premium feel. The all-black interior even features leather seats. 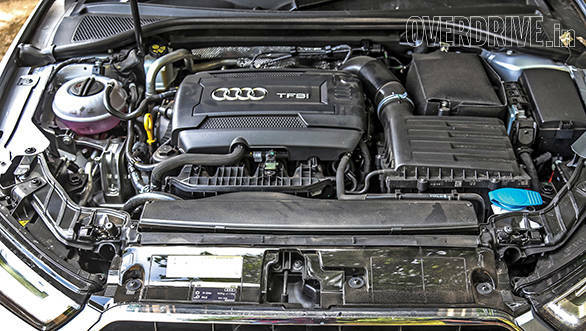 The TFSI motor is part of the same family of engines seen earlier in Audi cars but with a few updates. The 1.8-litre turbocharged petrol puts out 180PS of max power from 5,100 to 6,200rpm and an impressive 250Nm of torque that's available from as low as 1,250rpm all the way to 5,000rpm. This engine is mated to a 7-speed S tronic dual-clutch transmission. We were wondering why Audi didn't offer the same 2.0-litre TFSI seen in the Q3, but a drive in the A3 and we have no doubt that the 1.8 TFSI motor is indeed a good choice. Audi claims that the car will accelerate to 100kmph in just 7.3 seconds but in the real world we managed 8.3 seconds. This is still an impressive figure, considering the car is slow to launch from standstill. The S tronic transmission doesn't let one launch the car at higher engine speeds and there is a slight delay before all the torque steps in. The same transmission however offers instant and seamless shifts. Cruising at triple digit speeds is effortless and if you're in the mood for some spirited driving, Sport mode makes the engine more aggressive while gears automatically shift at redline. The only missing feature are paddle shifters, on has to rely on the gear lever if one wants to shift gears manually. In terms of efficiency, the car returns a decent 12.1 kmpl overall. 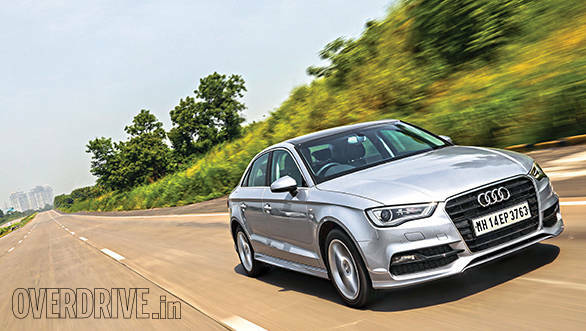 How does the A3 fare against competition? Well there isn't any really, the other two German cars are hatchbacks and offer boring petrol engines, the diesels are the only competition but that's a story for another day. However, at Rs 30 lakh, ex-Mumbai, the A3 40 TFSI isn't the most affordable petrol entry luxury car today but is definitely the most powerful and fun to drive.